The ultra-compact but loaded Faderfox controllers have a cult following among lovers of Ableton Live and Traktor DJ. They’re the rare controllers that actually seem to have been designed around software, with smart buttons for triggering Live scenes and clips, a slick X/Y joystick, and the essential knobs and faders just where you want them. They’ve been nearly impossible to get outside Europe, though, until now: Robotspeak has picked up US distribution. And if that weren’t enough good news for Faderfox fans, new models are on the way. Lucky Californians with their awesome music stores, while we have to make do with Guitar Center and Sam Ash in New York. Anyway, they’ll be happy to ship around the U.S. These controllers will cost you US$300 each, but it could be worth it: as Robotspeak says, they’re “much higher build quality and feature some really well thought out features which, we feel, make them worth the money.” You can blame the fact that the dollar is so weak against the Euro. Robotspeak also ships internationally, so if you’re not in the US or Europe, you might want to compare to get the best deal. a new version of LV2 named LC2 is in the development pipeline and will be available in december. LC2 will have a crossfader instead the upper button row on LV2. 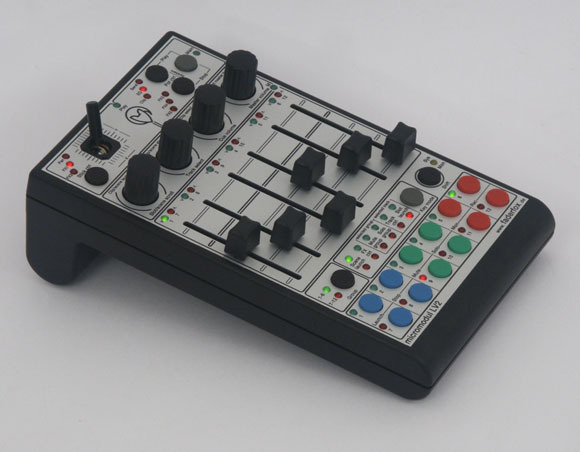 else you can try the combination LV2/DJ2 to have a LIVE-DJ-controller-set. a setup file for this team is in the package. another new babies are LD2 with 16 push encoders, also a LIVE extension controller and SY2 synth controller with 4 push encoders + led crown, 4 pots, stick, minikeyboard. the synth controller will have a one octave mini keyboard with led’s for each button so you can see which notes are currently held. And all the current and future controllers will be fully compatible with Ableton Live 6. I say August is never too early to add to your Christmas list. In the meantime, you can vote in comments: should I review the current models for CDM right now, or wait for the next-gen models?